With on-site image selection, subjects can email their image to themselves directly from the session. It is a rewarding experience for the subject and a huge time-saver for the planner. Guests steps over to the iPad kiosk to review their photos. Photos are immediately sent to the subject. If you have been to a conference anytime in the last decade you know the biggest challenges are to stand out and to create good connections. Place us near your booth, or assign us a few brand ambassadors and you can make focus on raising brand awareness with those waiting in line. Add signage and use our many branding opportunities (on iPad kiosk screens, in custom text, etc.) to keep your brand on their mind. Extend your brand awareness after the event – this new photo will be a valuable and widely used tool in each of those contact's professional profile. You are extending your brand's touch as long as that contact uses their new photo! On-site Image Selection – Editing Made Easy. Here's another speed bump when updating your staff's headshot photography. Getting everyone to select an image. Our on-site selection tool is perfect for those companies that need a quick turnaround. 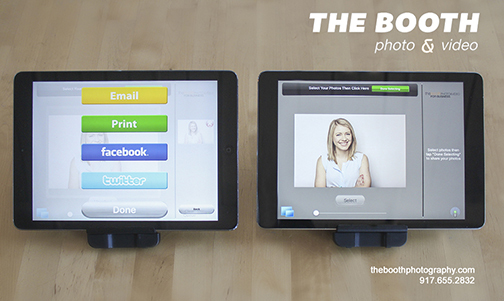 After each team member takes a photo, they step over to our iPad kiosk. Right there and then they select the image they want. We send you a spreadsheet and a gallery with those selections. One of the biggest difficulties our client faces when planning for headshots comes from within their own company: Scheduling your team can be like herding cats. Coordinating schedules, rearranging time slots and getting people to return a call can be a killer. We have a solution and it comes in the form of a simple URL. It's our online scheduling system. We send you a link to your customized scheduling webpage. You share that with your team. And receives a confirmation in their inbox. One day ahead, the team member gets a reminder about their headshot appointment. We can send you a list of who has registered and when. Our mission is to make every part of corporate headshot photography easy. So here's a quick outline from booking through post-shoot online gallery. Contact us via email, phone or contact page on our website. Look out for a proposal from us: how much time we need, background options, staff size, file delivery timeline. Watch our team show up on time, set up discreetly without disrupting your team's work, and be ready to take the best headshot photos ever! 48hrs later, look out for a link to your online gallery with download-able images. Our menu is short, but it's all you need. Really. The final step before the the job is done is to get you your photos. Again, we know it has to be easy to get them and the photos need to be easy to use. That is why we send you your images in the most commonly used file sizes and format for the most typical end uses. Images are delivered to you via a password-protected online gallery. Use the high resolution file to submit for a printed brochure or program Need to update LinkedIn? Your 72dpi file is ready to go. Is your project different and you require alternate formats or sizes? No problem. We will prepare your photos, as needed for your final end use. Our clients, big and small, often have staff working in multiple cities. What's the best way to cover a team like this? Bring us in during an annual gathering. Do you do an all-staff event every year? Schedule us in around it and we can be there to cover everyone. We work in many cities, many of which are considered local and would not incur travel expenses. Book us and you will have a consistency in look and process that makes your job way easier. If they are traveling to NY, have them drop in at one of our Open Studio days. 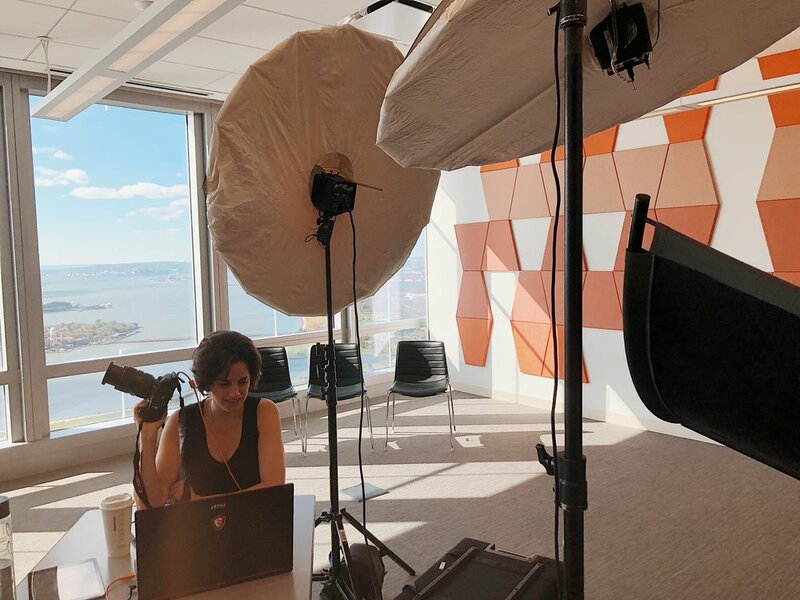 The booth holds periodic open studio shoots in NYC and Westchester. Individuals can sign up for a convenient time and pop in to get their headshot done quickly and efficiently. Finally, if it's a small group and we do not have anyone local, have them visit their local photographer. We can give them a style guide so the images can match. Green screen is also an option to help maintain branding consistency. Book your headshot shoot over 2 consecutive days. If someone is out on day one, they will likely be back for day 2. Book multiple days spread out over time – a month or more. You get all the above benefits, plus you can cover new hires, those that were out over long periods, or staff that has changed their look and wants a reshoot. Send those last few people to one of our open studio days. The booth holds periodic open studio shoots in NYC and Westchester. Individuals can sign up for a convenient time and pop in to get their headshot done quickly and efficiently. We get this question all the time. How does one dress for a headshot. The answer is easy: Dress like you are going to meet your best client. A headshot is the first opportunity to make an impression. Does your company service a more traditional industry? If yes, wear a suit. Does your audience value creativity? Then something less traditional can work. Whatever you put on make sure it is clean and free of wrinkles. Most importantly, make sure you feel comfortable and confident. The subject continues to feel relaxed and uses that easy smile for a great photo. The subject goes into photo mode delivering a pose that is their camera face. The subject panics and says, I look awful in photos and every bit of tension they are feeling shows up on their face. Let's be clear – we are not all Giselle and Tom Brady. It's tough to look good in front of a camera but we don't necessarily know what to do. That's where we come in... We can work with you to get that 'camera face' to relax and show the best you. We can help you feel relaxed, making small adjustments and talking you through it the whole time. You can come feeling dressed to the nines with your hair blown out and makeup done, but we argue that a photographer who makes you feel great is the secret ingredient. Headshots - Professional, Not Boring. Check out our most recent email. Gary is looking good! In honor of National Women's Day, here are 9 faces from the 2017 The United State of Women conference. LinkedIn is a tool for your business and shouldn’t be regarded casually. It's more than just a personal profile. It is a key channel for B2B marketing and a place to establish your brand as a thought leading field (read more in Forbes article about Brands and LinkedIn here). Your team’s headshots on LinkedIn matters for your company. Their professional profiles are an extension of your branding so make sure they are just as well-considered. We think you are all perfect and gorgeous, yet the most common question we get is, 'Do you retouch our photos?' Yes, we do, and for staff portrait packages, we include 15min for everyone. Special requests? No problem. We are happy to evaluate your needs and offer solutions. It is now possible for event attendees or staff to select and email their headshot directly from the event. It is a delight for people to get their images so quickly. Further, it considerably cuts down on the countless hours you would otherwise have to spend getting people their photos. -Step to the iPad kiosk to view the photos they just took. -Select the image(s) that they like. -Email the images to him or herself. Conferences – Attendees walk away with a new headshot that they can upload to LinkedIn before they leave the room. Staff Photography – Staff selects their image on the spot. We supply you with a list of selections, cutting your post shoot timing considerably. Getting your team organized for headshots is not easy. Chasing team members down and juggling schedules is time-consuming and difficult. With our scheduling tool we handle that piece of the headshot project, while giving you continued oversight. We send your point person a link to your customized scheduling webpage. Each person selects their preferred time. 1 day ahead the team member gets a reminder about their headshot appointment. We can provide you with a spreadsheet with all bookings at any point, helping you stay organized and on top of your team. Our mission is to make every part of headshot photography easy so we integrate this idea into every step of our process. Contact us with your company name, where you are located and how many people you want covered. Look out for a proposal that lays out a clear cut package, including your needs for: number of headshots or time, photography staffing, date and time, final image tranfer. On shoot day, the best photo team ever will arrive 2hrs early to setup and be ready for the first subject. Headshot photography has been around as long as photography, itself. In this series, we will post professional portraits of famous and not-so-famous people. People ask us all the time how our headshot service looks and works. Here is an example we thought we would share for all the world to see! Every event space is different, but here are examples of corporate headshots we did at events in New York City and Washington DC.